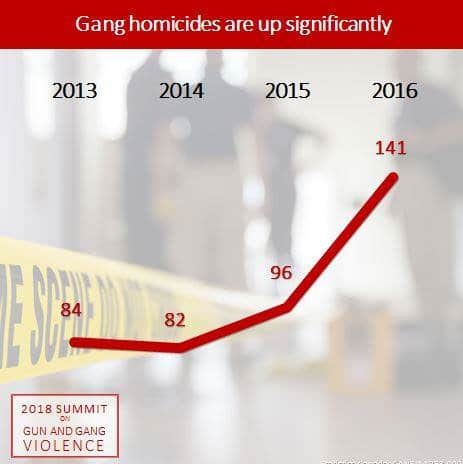 TheGunBlog.ca — Gang murder is heavy, so this is light: Canada’s Liberal-led government shared a series of charts today showing that gang killings and “gun homicides” have surged since the party took office at the end of 2015. The charts were published on Twitter today by the Ministry of Public Safety as part of its Summit on Gun and Gang Violence. TheGunBlog.ca wrote about the summit with data, stats, calculations and graphs, and runs the same risks of errors, misinterpretation and being poked fun at. Roast me gently. Bonus: The title of the chart above is generous about what “almost doubled” means, and creative about how to count years. Based on the graph, TheGunBlog.ca calculates homicides rose by two-thirds (66.4 percent) over three years. But it’s a pretty chart, so who’s counting.